Our award winning Gourmet Estate & Specialty Coffees originate on our private estate in the Western Valley of Costa Rica, a tropical wonderland world renown for its biodiversity, unremitting conservation efforts, and fertile coffee-nurturing soils. We produce only the finest SHB arabica coffee beans and are 100% confident that you will enjoy our gourmet products. 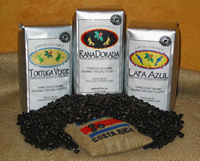 We look forward to serving you Costa Rica's finest coffee selections! Well Rounded, Full Bodied, Mellow & Smooth. On The Lighter Side... Bright, Delicate & Flavorful. Strong, Full Bodied & Bold! Gourmet Specialty Costa Rican Decaf. The Gourmet Flavor Without The Caffeine! Rainforest Sampler -- Why Decide? Enjoy One 12oz. Selection Of Each Of Our Gourmet Estate Coffees. Includes 1 Rana Dorada, 1 Tortuga Verde, and 1 Lapa Azul. KaffeTico Taster... The Perfect Introduction! Enjoy Enough To Brew One Pot of Each. One 2oz Selection Of Each Of Our Gourmet Estate Coffees. Includes 1 Rana Dorada, 1 Tortuga Verde, and 1 Lapa Azul. All of our gourmet coffees are roasted to perfection, fresh to order, available in whole beans or burr ground, and shipped immediately to your front door to ensure your complete satisfaction.